Actemium has designed and installed an automated banknote packaging production line for the Banque de France printer in Chamalières, central France. The processes improve security, productivity, and traceability. In Chamalières in the Puy-de-Dôme department, the French central bank’s printer is opening its doors to… robots. Faced with the need to upgrade the workshops that house its printing presses, the security printer called on ISI, an industrial solutions integrator that forms part of the Actemium network (VINCI Energies), to help revamp its banknote packaging production lines. Before works got under way and as part of a competitive dialogue, ISI started by “holding discussions with senior executives from the Banque de France’s printer about ways to introduce Industry 4.0,” explains ISI manager François Gsell. The client particularly appreciated this phase, using the preliminary study to “explore the various automation scenarios that would enable it to deploy fully automated banknote packaging production lines on the current site while anticipating their integration into the future plant that will bring together the paper mill and printing works,” says Michel Antony, process buyer for banknote production at Banque de France. “This preliminary expertise phase is very important,” stresses Gsell, “because that’s where the source of gain is for the company.” Here, the gain for the Banque de France printer is a qualitative leap in terms of security and faster packaging of bundles of 1,000 banknotes. Until the overhaul of the Chamalières workshops, the packaging process was partially automated, requiring human intervention to handle banknotes between two operations. It’s this direct human contact with the notes that Banque de France banknote production managers wanted to avoid, both to enhance security and to improve working conditions on the production line by reducing simple handling tasks. “Complete traceability” is a further benefit of automation, says François Gsell. As part of the new production line, a specific type of robot, equipped with scanners and capable of moving autonomously, is deployed to navigate from one station to another in the workshop. Robots are now present throughout the entire new production line and the process is fully automated. 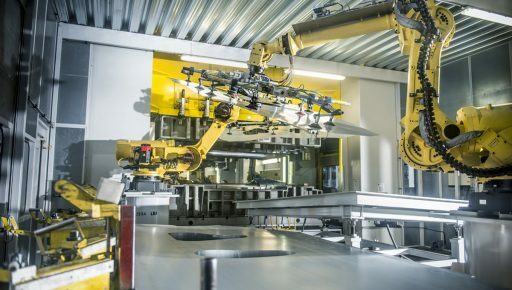 Indeed, robots are used for transporting banknotes (around the workshop), applying film (bundles are wrapped in a film of plastic), labelling, packing in boxes and loading onto pallets, sorting boxes, and finally weighing and removing pallets. A specific type of robot is implemented to navigate from one station to another in the workshop: an autonomous indoor vehicle (AIV) equipped with scanners, which is capable of moving autonomously while avoiding fixed or mobile obstacles (personnel, pallets, other AIVs). “ISI innovated by installing a safe-type compartment on the vehicle chassis which can only be opened in authorised areas,” explains Gsell. ISI met another, more conventional challenge by deploying the new finishing lines without interrupting production. Staggering the replacement of the 6 installations meant that 5 of the lines could remain operational at all times. In a few years’ time, the new plant, which will incorporate these new fully automated production lines, will come on stream. It will bring the paper mill and printing works under one roof, which will “help optimise flows and generate savings in terms of moving cash securely,” points out Michel Antony. Indeed, the current separation of the two sites forces the Banque de France to use an expensive cash transport system. And for this part of the process, in other words the secure transfer of banknotes, robots have not replaced humans. What steps can be taken to accelerate Industry 4.0? 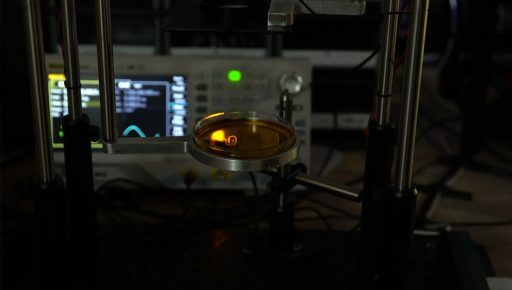 Daqri has presented a new hologram-based 3D printing technique that is faster than conventional solutions.